I hope this week has added to your knowledge of your characters. Taking those 5 minutes each day to do some character work will help grow your story. Come join me at Angelique L’Amour, Author. If we are lucky no one will be walking their dog by my house and he will stay quietly in the background. And if we remain really lucky with all this wind I will get to do this from my desk. The joys of living in Southern California. I promise you that evacuation of my neighborhood will be the only reason I miss this. Please come visit and ask a question. Or, if you can’t make it at 6pm, post a question under the video announcement on my facebook page. You can click here to do so. I will try to answer as many as possible. The questions can be about the character challenge or any other aspect of writing. I will also be sharing on how I keep my NaNoWriMomentum going without all those folks posting word counts each day. Hint: I get some help from my dad’s example and from Kate Northrup who is posting her daily word count on her instastories. She is inspiring me to keep going right now. Getting to know your characters is a freeing and powerful process. For me these folks walk into my life fairly well formed, but I have to make decisions for them. 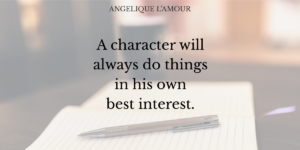 As my brother told me, “Characters do what is in their best interest.” We also have to remember that sometimes people are exactly wrong about what that is. Character traits can lead us to our next scene or beat in a scene. How do you enter a room? How do you walk in at the end of a long day? How do you enter if your best friend from forever that you haven’t seen in awhile is there? How do you enter if the IRS is there? These are great questions and I am just asking about the physicality of it all. We haven’t even gotten to the sound of the voice or the action of the scene.